I keep mentioning "joring" but I haven't posted specifically on the topic...until now! Daddy and Dante love to jore! However for those in the sport it is referred to as "Mushing" rather than just "joring". Joring is however a pulling sport, their is Urban Mushing (done in town), skijoring (pulled on ski's), roller blade joring (pulled on roller blades), bikejoring, Cani Cross, and Dryland. It's a sport that has been evolving across the world, involving horses, dogs, and even cars! Here is a brief history by Ruffwear. 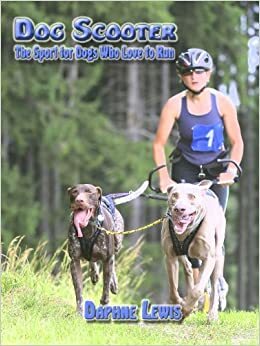 Many in the dog world use mushing sports as a form of exercise, mushers in particular use skijoring during the non-snow months to keep their dogs in shape and practicing as a team so that they don't get rusty. For skijoring the cross country skier provides power with their legs and ski poles, with the dog providing additional power with the pull. This is not you just standing being pulled! You are working as a team with your dog. Mushing is an awesome way to keep your dog in shape! It's both a cardiovascular and muscular workout for your dog - very heavy on both, and it builds a very powerful dog if you stick with it. When mushing (joring) with dogs; typically 1 - 3 dogs are used. When mushing the rider calls out voice commands, no other reigns or signals are used. 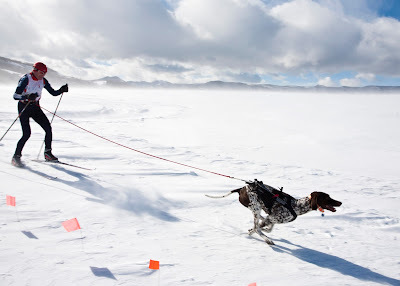 The dog's love to run, drive to work, and bond with you are the driving forces behind a successful mushing experience. It's easy to get started in a mushing sport if you have a dog who loves to pull. When we first adopted Dante he pulled really bad! Before you ask your dog to pull we believe it is important for your dog to know how to walk. A strong bond between you and your dog are the keys to success. Your dog needs to be able to take verbal instruction and follow through with those commands. Really though you can teach your dog any term so long as you yourself are consistent with what those terms mean. However it is important that you use short words with few syllables so that you can be fast in calling out commands. Once your dog has mastered the walk, you can start training. Dogs can easily distinguish behaviors from tools, for Dante neck pressure means stop, harness pressure means pull. Many dogs naturally pull so this was a fairly easy step to connect, and since Dante already loved to pull he was very excited to discover he had permission! Disclaimer - We were totally new to urban mushing and still are, we are learning as we go through different online communities. In our area their are no groups for us to meet up with so we have to learn on our own. Please be careful when training: Pick safe areas to practice and know how to use your equipment properly to avoid injury for both yourself and your dog. My husband loves to roller blade (Me? I'm not very good at it..) he can do fancy footwork and stop on the fly. So he decided to urban mush with Dante using roller blades - people also use skateboards, bicycles, and kickbikes/scooters. Not all harnesses are made equally! If you are going to mush with your dog you are going to need a proper harness. And even among the mushing/joring harnesses their are different designs for different purposes. Research your harness before you buy! Protective gear for what you are joring on - Safety 1st! Lunge line & Leash for backup. Hook Dante up into his harness, initially the hubby used two lines: one on Dante's harness, the other for backup on Dante's neck collar. Dante's harness attaches close to the base of his tail, it is designed to lay flat across his back thus evenly distributing the pulling weight across his chest and shoulders. Editors Note: Dogs should not run and mush on pavement. In some of the sites where I was researching, they said that in some cases you may need to do a short distance on pavement before reaching your destination but that the distance should be kept to less than a 1/4 of a mile because pavement offers no give which can damage your dogs pads more easily when pulling. In a nut shell, when you are training or conditioning your dog to run and pull with endurance you are damaging their joints in the long run when you run on pavement. If you train regularly you can wear down the pads on their feet, and rip/scuff toe nails. *For those who have a hard time finding a good dirt trail you can usually find a bike trail where your dogs can run in the grass while pulling you on the paved section. Step 2. Stops and Go's. The hubby used the command, "Go! Go!" queuing Dante to start pulling. 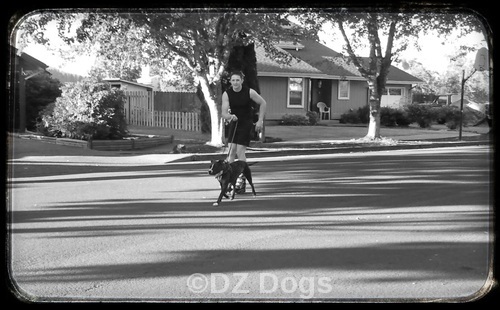 At first Dante wasn't sure what to do so the hubby skated along and encouraged Dante to pick up the pace, once Dante started trotting he received tons of praise. During this time the hubby would say, "whoah" and jingle Dante's collar he'd then put on the brakes and physically slow Dante down, and then "stop", coming to a complete stop with Dante. Back and forth they practice, just stops and go's. A few minutes later they were flying! A great way to start with your turns is to walk or jog behind your dog, call the command and gently steer them in the beginning. Ultimately you will not be steering them as your training progresses. In the hubby's case...I'm sure other people have their own techniques. The hubby would call a command, and from behind Dante use the lines to gently (don't yank your dog while they are running!) steer Dante in the proper direction as the command was called. Practice, practice! It's fun and great exercise! As you are training your dog keep in mind that you need to slowly build up their endurance. Don't go train everyday! Just like a human athlete your dog needs breaks to recover from a hard workout. Pay close attention to the pads of their feet, before and after every training session. If you are out mushing for longer periods you will need to check them more frequently. Your dog is going to need lots of water! And potentially extra fuel after a hard workout. Dante typically eats an extra 1/2 cup of food after a day of urban mushing. Puppies and any dog under 2 years of age should not pull! Pulling is a strain on your dog physically, if you start before your dog is done developing you run the risk of harming your dog's growth and potentially damaging their joints. Your dog needs to be listening to you for safety reasons, "leave it", and "on by" must be respected or you could end up on a wild chase after a prey animal or clashing with another dog. It's important that you are able to keep control of the situation: brakes for bikes or kick bikes, brakes on roller blades (if you know how to use them), double leash system in the beginning...etc. Do your research, know your dog and your equipment before starting. Mushing sports are great for most dog breeds, typically 35+ pound dogs are the best when it comes to mushing. Any smaller and you run the risk of harming your dog physically. Notice, Ziva is running but not actually part of the pulling yet. She's just training becuase right now she's still too young to actually pull. Have Fun! Mushing is addicting and creates a strong teamwork bond between you and your dog. Plus it's tons of fun! If you are part of the sport we'd love to hear from you! We're always open to learning new and better ways of doing things! We found an abandoned road to go urban mushing with the dogs, it's not very clean...lots of tree debris and roller blade wheel hazards, but it was fun! A big problem that we have is that in our area it's hard to come by good trails for running the dogs on. The trails we have found are either straight up, straight down, or barely count as a trail - one person wide and no room to pass. We're still looking for our "perfect place". :-) Snow season will definitely help create for us more room to run! A great resource shared to me is "Dog Scooter" By Daphne Lewis. I just ordered it online! Can't wait to read it! Thanks for joining Barks and Bytes! I have a hilarious story i'll cover next regarding me on roller blades....ya...not so good. :-) I definitely want to do the skijoring though! I have always been interested in skijoring. I have never tried it though, Looks like a lot of fun! Looks like fun but I could see disaster for me written all over that...lol. I can't always walk a pheasant field without falling down from a hole! Thanks so much for joining the hop! I have been mushing, teaching mushing, and writing about it for years. 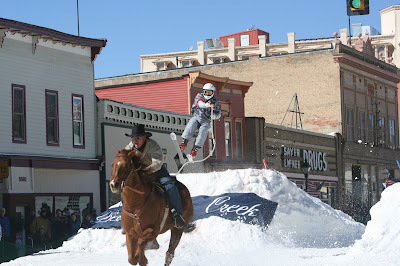 I have raced and placed in the largest skijoring race in the world :-) I also race teams in scootering, bikejoring and canicross. We mush and mountainboard with our dogs as well, just for fun. We love to see new teams get involved in the sport! I am passionate about mushing and would be happy to mentor you, or find you a mentor in this sport. I am a stickler for safety. We could start by looking for a safe trail to run the dogs, work on some commands and then graduate to a bike or scooter when you are ready. Always wanted to do this! Been eyeballing the joring harnesses for some time, but been very apprehensive about my ability to do this safely. But boy does it look fun. PepiSmartDog: great post! Like the way you always include lots of details and instructions. Thank you for joining our Thankful Thursday Weekly Blog Hop.